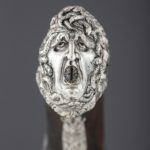 The Met puts a cache of rare decorative English firearms on view for The first time. When John Byck first joined the Metropolitan Museum of Art’s Department of Arms and Armor as Assistant Curator three years ago, one of his first tasks was to identify areas of the department’s collection that could benefit from further research. While digging through the collection, he came across a remarkable find: a group of about 30 British firearms from the 18th and early 19th centuries, all in storage, that had not been critically examined since they entered the Met’s collection almost a century before. What’s more, many of them were highly significant—either very rare pieces or of exceptional quality. Byck had found his next project. “I read every book I could find on the subject,” he says. “And while I was recataloguing the firearms, I found that many had these exciting stories to tell.” To track down these stories, Byck made several trips to the United Kingdom to visit archives and private collections. The result of this research and analysis is the exhibition “The Art of London Firearms,” the first U.S. museum show to examine the topic. It opened on January 29 and will remain on view through January 29, 2020. The guns in the exhibition were all made by a small group of gunmakers on the outskirts of London, beginning around 1780. These craftsmen were in fierce competition with one another to attract commissions from wealthy customers, and this situation produced a level of artistry and refinement previously unknown in the flintlock firearm. 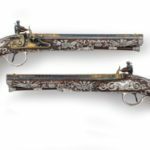 This time period therefore not only resulted in higher-quality decoration but also in the first development of a truly English style of firearm. 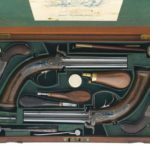 With so many impressive examples of British firearms from this time period, one of the first questions Byck approached was how to determine the gun’s quality. “In order to understand where they fall on the spectrum of quality, as is true of any artwork, we have to look at the best examples and determine what those markers of quality are,” Byck says. “What type of embellishments do they have? How beautifully are the barrels made? Are the stocks finely finished? 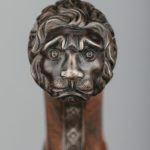 What motifs are commonly featured on royal firearms? Are the pieces still in their original cases, with original finishes?” The pieces in the Met’s collection were made for presentation or sport and were considered functional works of art in their own day, just as they are now. In addition to the decorative elements, provenance was another highly important factor in Byck’s examination of this collection—and this was something that could really only be thoroughly researched through travel. 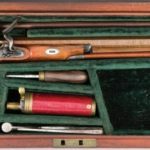 One of the pieces that was most rewarding for Byck was a cased set of four-barreled percussion pistols made by gunmaker James Purdey in 1831, purchased by the Met in 1935. “When I found these pistols, I knew they were important, but I didn’t know exactly why. So while I was in London, I had the chance to visit Purdey’s archive, and in that archive I found these pistols,” Byck says. He discovered the original owner, the date of purchase, and the price paid for them—which revealed that they were the most expensive pistols Purdey had made up until that point, 30 or 40 years into his business. What’s more, Byck found that the purchaser was the 4th Duke of Newcastle-under-Lyne, an influential politician at the time whose archives still survive. By visiting that archive, Byck was able to reconstruct almost the entire story of the pistols’ commission. 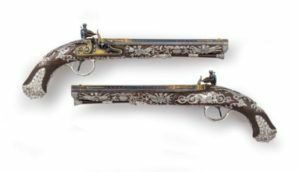 Another significant piece is a pair of flintlock pistols made by Samuel Brunn. Decorated with extremely fine silver mountings, they were most likely made for the Prince Regent. “They’re arguably the finest Neoclassical British firearms in the world,” Byck says. Yet another standout is a target pistol made by Robert Wogdon and John Barton for Prince William Frederick, 2nd Duke of Gloucester and Edinburgh. The pistol has an elegant curved stock and long barrel, with minimal embellishment.